Heh, my movie-watching fare has changed somewhat over the last half-decade or so. With a seven-year-old daughter, there are many more family and children films going through our DVD player. This afternoon, on their first day of summer vacation, my daughter and her little friend watched Because of Winn Dixie (which my kid’s teacher just read to her class). I worked at my computer, but kept an eye on the film—and I’m glad I did, because I enjoyed the movie (and it’s WELL worth the addition to your own Netflix queue). And one scene in particular cracked me up—and left me more than a bit thoughtful. Ten-year-old Opal (AnnaSophia Robb) lives in Naomi, a small Florida town which is still suffering from the closure of a candy factory years before. Her father, whom we know as Preacher (Jeff Daniels), is the new minister in the town’s church, whose parishioners sit on rows of lawn chairs and folding chairs in the local convenience store. She befriends a dog one day in a Winn Dixie (a grocery store chain at which I shop at least once a week), who begins the process of connecting her with the town’s recluses (like she) and brings the people alive. Which brings me to the church. She and her dad bring Winn Dixie to church one Sunday after their landlord tells them how he shut up his own (now deceased) howling dog years ago. (You figure it out—the Preacher sure did.) As the church’s four-woman choir sings a wonderfully off-key Amazing Grace, the dog howls outside. The congregation—whom we’ve only seen as docile and uninterested and unmoving (except to fan themselves)—begins looking at each other, smiling, even laughing. Finally, Preacher stops the service and looks hard at Opal and tells her to get the dog. As she brings Winn Dixie in, some of the former stony bored faces are softening. One child asks, “Are dogs allowed in church?” But the dog sits quietly, and Preacher begins his sermon (actually sounds somewhat interesting) designed to try to bring the townspeople together into some sort of community. But Winn Dixie spots a mouse in the corner, and, of course, all heck (or heaven?) breaks loose. There’s more movement in the church in those few minutes than years of Sundays combined. The dog finally brings the mouse in his mouth to the front of the church, lets it down, and clamps its paw down on its tail. 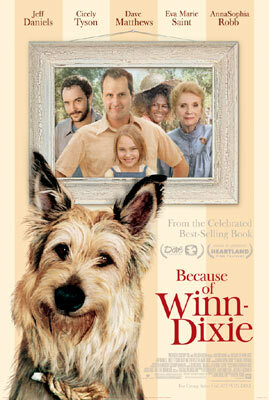 An old woman in the front row looks at Winn Dixie in awe, exclaiming in wonder that a dog could catch a mouse. All eyes on him, Opal’s dad picks up the mouse by the tail and says with resignation, “Let’s pray.” The church goes motionless and silent again, bowing their heads. But Preacher—as I so hoped and prayed—isn’t finished: “For this mouse,” he concludes with a grin. Bodies move, people laugh, faces soften. I don’t know if the filmmaker intended it, but that scene shows God and his people in pure glory. Often, our best plans—whether a sermon designed to move people to community or our methods to bring people to Jesus (which reminds me, you must read McKnight’s Emerging Evangelism? )—are just that: ours. God, however, is much more creative than we. His Spirit is vibrant, ever-moving in every moment, weaving and working God’s good and beautiful and loving and perfect plan—every moment, even a dog howling at Amazing Grace or chasing a mouse in a make-shift church. That dog started a process of bringing the people together and opening them to each other—and Preacher—more than any sermon every could. If we are watching and waiting expectantly, asking “What next, Papa?” we catch those moments just like Preacher did. Instead of continuing with his own plans, he entered God’s. When our eyes are open to God’s wide open spaces, that’s what we do too. That’s a theme that weaves through and attracts me to emerging church discussion. And we can do with more conversation like that—even if it begins Because of Winn Dixie.